The goal of Seido Karate is to attain physical, mental and spiritual growth. For those interested in self improvement, what is learnt in the Dojo can be used to enhance their everyday lives. Our training is of a progressive nature. Even unfit people can safely begin karate and enjoy the benefits, as they progress at their own pace. The motivation that comes with group training, and the incentive of learning and developing skills, brings students to a high degree of all round fitness. Our students range in age from 5 – 75. Seido Karate is one of the most effective and efficient forms of self defence. Students learn to use the entire body as a weapon, developing the ability to defend themselves against much larger and stronger assailants. Accordingly each person grows in confidence and develops an awareness of how to avoid confrontation. Seido Karate is a traditional school. It teaches that, while karate is an excellent means of physical conditioning and self-defence, the real purpose of this martial art is cultivation of character. In Nelson we have our own Dojo or training hall. Over the past 35 years it has developed a strong reputation worldwide, for the high quality of its teaching and the standard of its students. We also offer meditation classes. One of the many benefits of being part of Seido Karate is the close and lasting friendships that are formed. Born in Japan in 1942 Kaicho started Karate at an early age and rose to become the worldwide Chief Instructor for Kyokushinkai Kaikan Karate. Disillusioned with the way Karate was heading and its emphasis on competitiveness, Kaicho formed Seido Karate in 1976 based on the principles of LOVE, OBEDIENCE and RESPECT. Kaicho wanted to return Karate to its original root values – that is that everybody, men, women and children from all walks of life should be able to safely practise this beautiful martial art. A 9th Degree Black belt, Kaicho’s ideals, beliefs and philosophy of living have given strength and inspiration to thousands of students around the world. Kaicho, with his son Nidaime Kyoshi Akira – Vice Chairman of World Seido Karate, teach and practise Karate daily at the World Headquarters in Manhattan, New York. Karate is two words together— ‘Kara’ means empty and ‘Te’ means hand. Seido comes from the Japanese words ‘Sei’ and ‘Do’ meaning sincere way. The origins of Karate can be traced back thousands of years to China & Okinawa. In the 5th Century Master Bodhidharma from India taught a form of meditation at the shaolin monastery in China. Bodhidharma found the assembled monks in poor physical condition and subject to attack by bandits. He said “Although my teaching is meant to nourish you spiritually, in reality the spirit and body are one. From tomorrow, you will rise and train in the following method”. Sanshin Kata is attributed to Master Bodhidharma. Okinawan martial arts were influenced by traders from China and practical empty hand techniques(jutsu) were developed by the Okinawans when weapons were banned by Japanese invaders in the 1400’s. Karate then was very much just for self-defence although just the ‘no quit’ spirit empowered courage and self-esteem amongst the islanders. The Japanese had many martial arts of their own, their main unarmed combat system being jujitsu. With the advent of the firearm the Martial Arts went from being just practical technique (jutsu) to ‘Do’ (way). The way being a path or journey to self-discovery and realization. In 1922, Okinawan Master Gichin Funakoshi was invited to Japan to formally introduce Karate Do. The way of Karate quickly became very popular and one of his first students was Masutatsu Oyama. Master Oyama studied other styles as well including Goju Ryu. In 1953, he formed his own Dojo and style called Kyokushin. In the 1960’s both Hanshi Andy & Hanshi Renzie trained with Master Oyama in Tokyo. In 1966 Kaicho Nakamura as Kyokushin’s head instructor was sent to the USA to teach and promote Kyokushin Karate. In 1976 Kaicho Nakamura started SEIDO Karate. 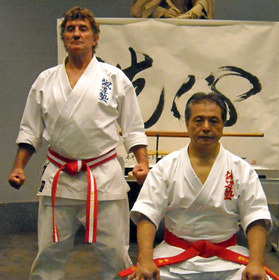 Kaicho invited Hanshi Andy & Hanshi Renzie to join this new organization.Kaicho felt Karate Do should return to its original roots, that is everybody should be able to safely practise this beautiful Martial art.